Meal Starters | Spices Etc. Spices Etc. Gourmet Meal Starter Kit is the perfect gift for almost any occasion. 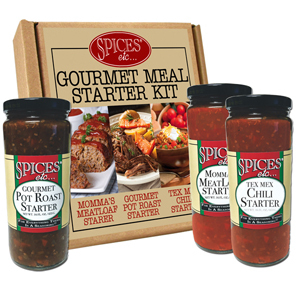 Our starter meal kit contains our best selling Meatloaf Starter, Pot Roast Starter and Tex Mex Chili Starter. Each one provides almost all the ingredients for a gourmet dinner that is easy to cook and delicious to eat!! This gift is great for newlyweds, recent graduates, a dear friends or special family members. These meal starters are off the charts good!!! Who doesn't love momma's classic meatloaf? Homemade meatloaf creates a culinary nostalgia for Sunday dinners or grandma's house. Served fresh out of the oven, meatloaf brings the family together without taking hours to prepare. 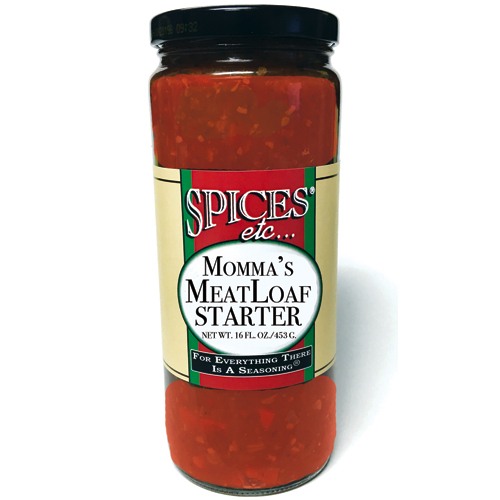 Momma's Meatloaf Starter uses only the freshest ingredients and is made with love, the only way momma would make it. All the key ingredients are in the jar, you just need to add the meat, pork, bread crumbs, eggs and ketchup!! It is perfect for today's busy lifestyles and families on the go!! Delicious and convenient! Spices Etc. Pot Roast Starter helps making dinner that much easier, while having a down-home flavor!! Create a traditional Sunday pot roast any day of the week with this delicious and easy starter. 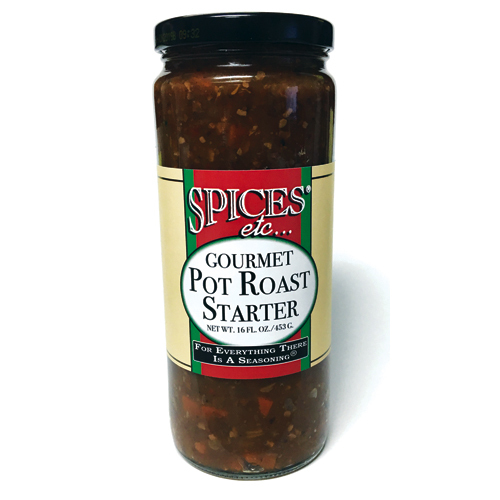 Made with caramelized onions, merlot wine, carrots, rice, mushrooms and much more, our pot roast starter can be used in the oven or in a crock pot. The savory sauce is enough for a pot roast to serve 6 and cuts down on having to buy all the ingredients at the grocery store. All you need is a 3 lb. roast and your appetite. More than just a chili seasoning, Spices Etc. 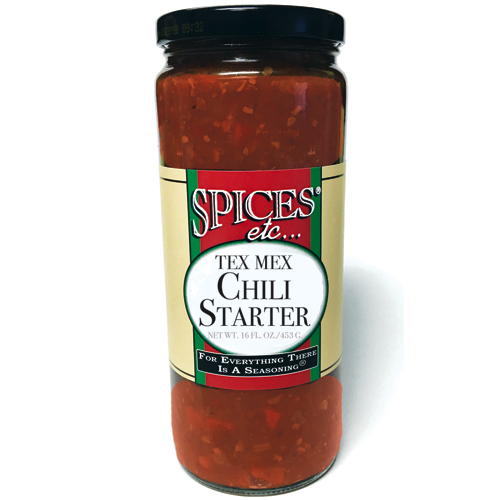 Tex Mex Chili Starter is a new creation that delivers BIG flavor to all of your favorite Latino and Tex Mex recipes. Whether you are cooking a dip, soup, taco, burritos, appetizers, layered salads or more, it is more than just a chili seasoning. Our creation delivers big flavor and is easy to use. Just brown 1 lb. of beef, chicken or turkey, add 1 can of drained beans and 1 jar of Chili Starter. Simmer 5-10 minutes and serve!!! It is that easy!! !